Forty years of Soviet nuclear testing turned a large area in Kazakhstan into a radioactive wasteland. Today it is at the heart of a nuclear weapon-free zone encompassing the whole of Central Asia, a model for a safer future for our planet. Atomic Lake was deliberately created by an 1965 atomic explosion. The dream was irrigate; the reality was a radioactive danger zone. It is just part of a cold war legacy still looming over Kazakhstan, the Soviet Union’s main nuclear weapons testing ground. At ground zero at the Semipalatinsk nuclear test site it is possible to see the extent of the damage. Forty years of Soviet atomic weapons testing have turned an area roughly the size of Belgium into a radioactive wasteland. More than 450 nuclear charges were detonated here before the site was officially closed exactly 20 years ago. For the International Atomic Energy Agency, Kazakhstan’s decision to ban testing and dismantle its share of the Soviet nuclear arsenal is exemplary. “Nuclear disarmament is needed, and we can contribute through verification. Nonproliferation efforts are essential. Terrorists should not have nuclear material. 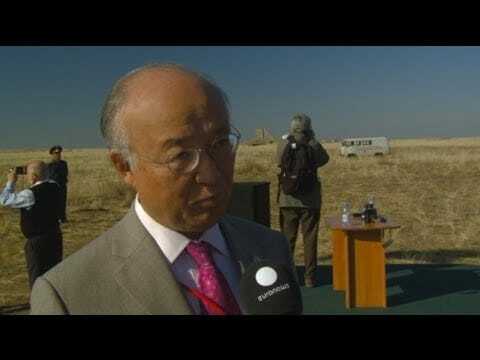 And creation and implementation of nuclear weapon-free zones is conducive to creating a world free of nuclear weapons,” said the IAEA’s Director General Yukiya Amano. At a safe 500 kilometres from the former test site, a forum has been discussing ways towards a nuke-free world. It brought together government officials, lawmakers and non-proliferation specialists from 26 countries and 18 international organisations in the Kazakh capital, Astana. Chiyoko Motomura is one of the few. Her terror of an atomic apocalypse is too real to forget. She was six years old the morning Nagasaki was bombed. Most nations agree that the world would be a better place without nukes, but efforts to ban test explosions are stalling: nine countries, including the United States, delay ratifying the treaty. Mutual distrust like this prevents a comprehensive nuclear test ban from becoming international law, rather than just a voluntary moratorium. Nevertheless, a new infrastructure is being deployed to ensure any future nuclear explosions will be impossible to hide. “We have around 280 facilities which are monitoring the underground, underwater, and atmospheric environments. We have another 220 communication assets. All together five hundred facilities – around the globe, around the clock, are monitoring the hopeful silence of nuclear weapon tests,” said Tibor Toth, Executive Secretary of the Preparatory Commission for the Comprehensive Nuclear Test-Ban Treaty Organisation, the CTBTO. So far, the site in Kazakhstan remains the world’s only nuclear testing ground that has been decommissioned. Parts of it are being developed for peaceful use, but many areas at the explosion sites are still too dangerous to get close to. A world free from nuclear weapons may seem an idealistic utopia. However, many believe it is possible, and the emergence of nuclear weapon-free zones like Central Asia is a promise of a safer future to come.